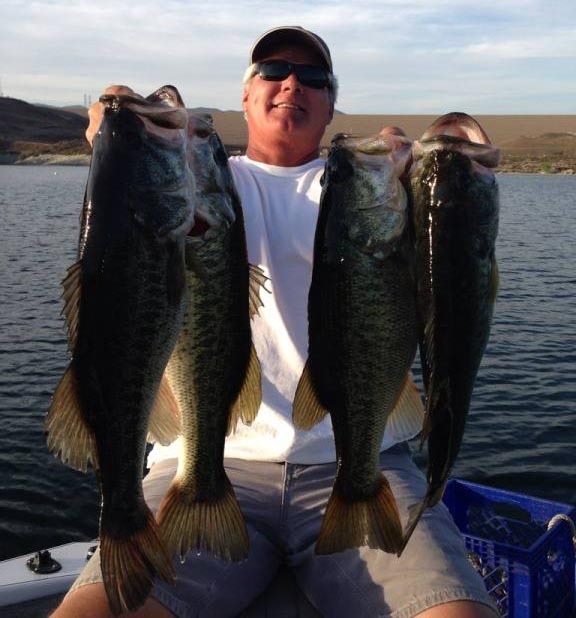 My name is Dave Horst and I’m a California licensed fishing guide offering instructed trips to Castaic Lake (both upper and the lagoon) and Pyramid Lake. We primarily target largemouth bass and stripers using a variety of methods depending on the season. These methods include artificial lures and a variety of other more commonly known techniques. Live bait such as shad and crawdads when available. Along with the loads of stripers and largemouth bass we catch, we often catch smallmouth bass and catfish as well. We can customize any trip to fit your needs. Please don’t hesitate to contact me to discuss further. If you’ve never hired a guide before, the price of a trip with an experienced and professional guide might initially sound expensive. But hiring a guide is about so much more than a day of fishing. Not only will your trip be enjoyable, entertaining and rewarding, but it’ll be an investment into your future as a better angler. I’ll teach you loads of information that has taken me a lifetime of time on these lakes to learn. You’ll see the secret spots, get to see and use the hottest baits on the market, and learn to better understand the process of catching more and fish. Without the knowledge I can share you’ll be susceptible to wasting hundreds, if not thousands of dollars on tackle and equipment that either doesn’t work, or that you won’t know when or how to use. Take one of the few shortcuts in fishing, book a trip with a guide to show you how it’s done. We look forward to fishing with you!